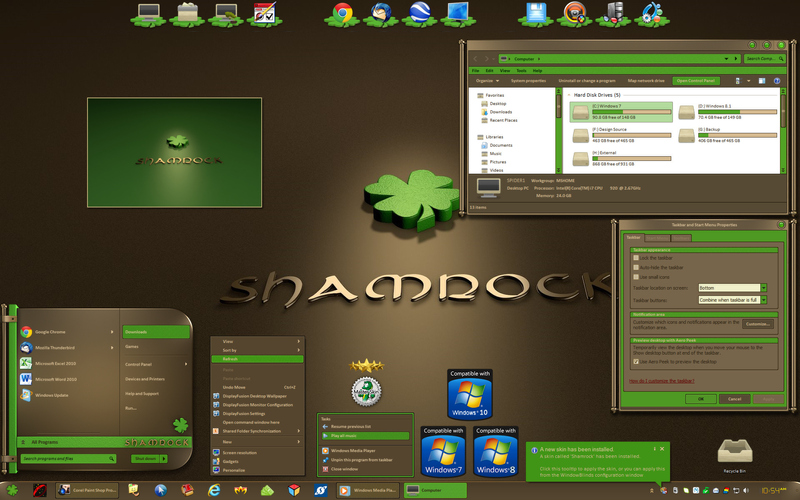 Shamrock is a beautifully designed Windowblinds skin for Windows 7, 8, and 10. Included with the skin are two desktop wallpapers in both standard and widescreen formats, and there is a great ObjectDock tile too! Many long hours were spent on the design of this skin, and to my testers I say thanks so much, I really appreciate your input. I know you'll enjoy Shamrock, and may lots of good luck befall you! Very good looking blind I have bought it and like it keep on with the good work. Does this have a rollup option on the right or left? I use those skins more than others because that is a necessary feature for what I do. I am very likely to purchase those kind of skins. I do not make skins. May I suggest also that you don't put personal information, such as your email address, in the forums. Really sharp looking design, by the screeny, which is all I have, you really did a great skinn with nice color, and the start menu shape looks cool. [e digicons]5*[/e] [e digicons]5*[/e] job. Just exactly how do you set it to roll up? "Open Windowblinds 8 and in the upper right corner area click the settings icon (the gear). At the bottom of the window that comes up you can set double clicking on the top frame to Rollup/Down Window, or you can set right clicking to do it. Easy change that can also be done in the settings area of Windowblinds 7. Then apply your skin again and rollup will work with whichever setting you decided to use."